Montecristo Classic Cigars, with their iconic brown band, are among the most recognizable premium hand rolled cigars on the market. Earn up to 301 Points Points. Montecristo Classic Cigars, with their iconic brown band, are among the most recognizable premium hand rolled cigars on the market. These attractive chestnut brown cigars are silky smooth with a flavorful Connecticut shade wrapper and Dominican binder and filler tobaccos. 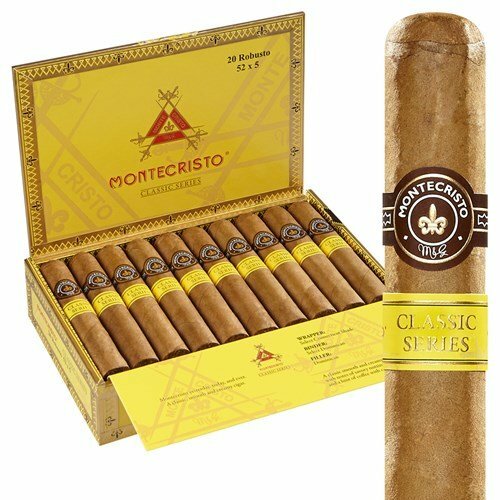 Complex and elegant, for the smoker who wants a consistent and tasty mellow to medium-bodied smoke in a large variety of shapes and sizes, Montecristo Classic is sure bet. To create the Montecristo Classic cigar, only the finest Connecticut shade wrappers were hand-selected to conceal a superior mixture of top-notch Dominican long-fillers. As expected, quality is on point with each cigar, producing a dependable cigar that’s mild, smooth, and well-balanced. Notes of wood and earth are present just before a crisp, somewhat spicy finish completes each puff. The Dominican version debuted in the United States in 1995, during the peak of the cigar boom. They are medium-bodied with a moderate finish. As one of the most recognizable names in cigars, this newer Dominican version lives up to the prestigious reputation set forth decades ago, combining an enticing aroma with flawless construction. This cigar is an icon in the cigar industry.